Firstly, the motorcycle you ride must be of a certain type. Two types of motorcycle are allowed in the club. These types are Cruisers and Tourers. No other classification of motorcycle is allowed. A Cruiser motorcycle is any motorcycle that has been listed as such on the manufacturer’s website. A Tourer motorcycle is any motorcycle that has been listed as such on the manufacturer’s website. Then, if you've got the right type of bike, come for a ride with us! It doesn't matter at all if you don't know anyone who's currently in the Steel Horses club. Just turn up and come for a ride! Check on the Ride Calender for a ride you would like to go on, and contact the Ride Captain for that ride, so he will keep an eye out for you! Afterwards, we'll explain everything else you'll need to know about becoming a Steel Horses member. 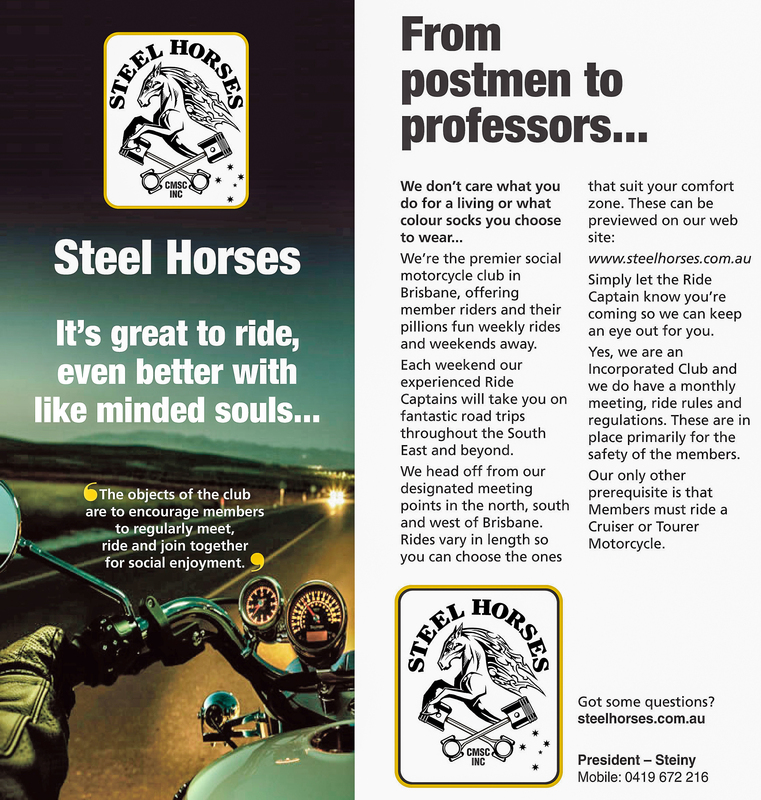 Have a look at our Steel Horses flyer/brochure.